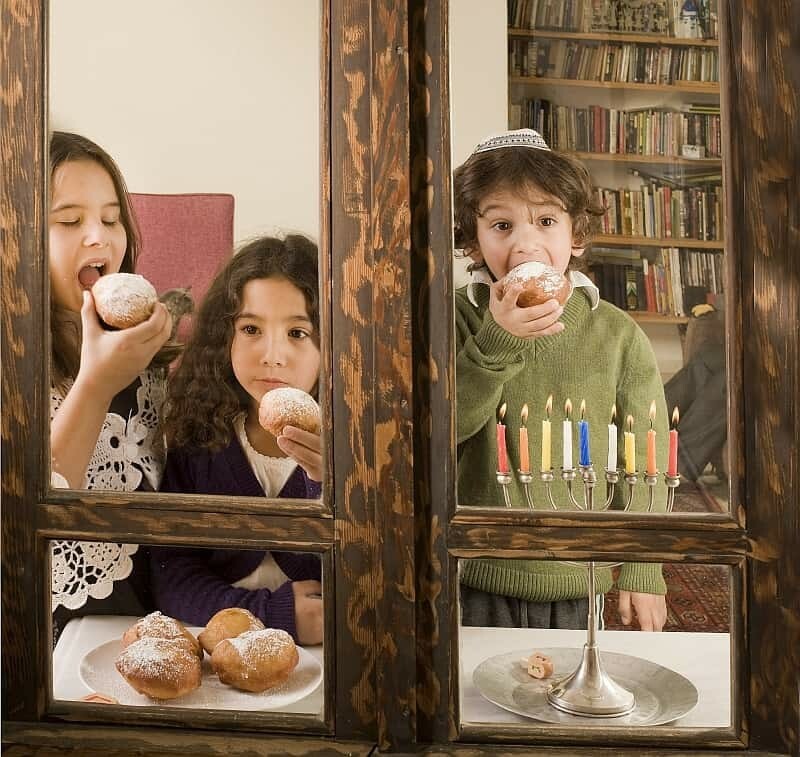 Directions for 20+ easy Hanukkah snacks for preschool through 2nd grade. We make no-bake jelly donuts with the two’s. You will need two slices of fresh white bread for each child, jam for spreading, dreidel cookie cutters, and tongue depressors for spreading. have the children spread jam on one slice of bread and make a sandwich with the other slice. Use the cookie cutter to press out the dreidel shape (just like play-doh) and enjoy! We make edible menorahs with the two’s. Cut a banana in half and slice it down the middle lengthwise. Count eight pretzel sticks with the children and have the children stick the pretzel sticks into the banana like the candles on the menorah. Say the blessing with the children and gobble up this delicious snack! -2 bags Simply Potatoes hashbrown potatoes or one large bag frozen hash brown potatoes, thawed -2 tubs Egg Beaters ( the equivalent of 4 eggs -1/4 c. AP flour -1/3 c. olive oil -2 tbsp. dried minced onion Combine all ingredients in a large mixing bowl. Heat a 10-inch skillet to medium temperature. Use a serving spoon to drop about 2 tbsp. (doesn’t have to be exact) of the mixture into the skillet. Use the spoon to shape the mixture into a circle about 1/4 to 1/2 inch thick. Three to four pancakes should fit in the skillet at a time. Brown for about 4 minutes, then use a spatula to turn. Brown the other side for about 4 minutes, then use a spatula to remove from pan and place on a layer of paper towels to drain. Let your children try them the traditional ways with applesauce or sour cream, but they’ll probably like them better with just ketchup. Decorating cookies for Chanukah. Bake sugar cookies (or use store-bought cookies). Give each child 2 Ziploc sandwich bags with about a tablespoon of white frosting in each. Drop a drop of yellow food coloring in one bag and blue in the other. Seal the bags and let the children squish the bags to mix the color. Snip a corner of each bag and the children can decorate their cookies with the yellow and blue frosting. It’s a great Chanukah party snack and science as well. Also, it is easy even for 2-year-olds! Chanukah light snack Pineapple slices Banana slices cherry for fire Put a banana slice upright in pineapple slice put a cherry on top. Enjoy. Dough-nuts kids can make. Purchase pre-made dinner rolls (such as Pillsbury) Give each child several circles of the dough. For filled dough-nuts, have them place a few chocolate chips, jelly, etc. in the center of one circle. Then take another circle of dough, and place on top, pressing the edges together to seal. Roll in confectioners sugar, or a mixture of cinnamon sugar. For ringed dough-nuts, give the child a bottle cap and let them press it into the center of the dough. Use the center dough for doughnut holes, rolled in sugar, or glazed with icing. The adult then fries them up for kids to eat. A thin glaze can be made by mixing confectioners sugar and water, and then brushed on dough-nuts after they have been fried. My kids love this! And they take such pride in their contribution to our snacks for the holiday. Especially yummy with hot chocolate after the lighting of candles. Stained glass cookies. Mix together a sugar cookie recipe. Ground up clear hard candies, separating colors. (My blender works great for this.) On a table place a bowl of chilled dough and several cups of the separated colors of ground candies. Also, have small pieces of aluminum foil for the kids to make each creation on. Give each child lumps of the dough. Have them make “ropes” out of it, and then help them form the ropes into symbols about Hanukkah. In the gaps created by the rope outline, fill in with the crushed candies. (cover the open space well, but you don’t need to fill to the top of the dough.) They can also form indentations to the dough, and sprinkle bits of candy there, for things such as a flame on a candle. Each creation should be made on a separate piece of foil so they can be easily placed on a baking pan. Don’t remove the cookie from the foil, as this would destroy the creation. Bake as normal sugar cookies, but check often to make sure the candy doesn’t scorch. The finished product gives you a beautiful “stained glass window” effect as the candies have melted together. Mixed colors in one opening turn out beautiful! This is simple even for tiny hands, with just a bit of guidance. And even if you’re not sure what your 3 yr. old symbol is, they are proud to tell you! Variation: Use peanut butter instead of cream cheese. Make an “edible dreidle” out of a pretzel stick stuck into a marshmallow. Use peanut butter or frosting to “glue” on a Hershey’s kiss. Roll in sprinkles, too!